Specializing in Auto Hail Repair & Paintless Dent Repair! Our Auto Hail Repair shops, located in Dallas and Rowlett, are focused 100% on repairing all insured vehicles damaged in Dallas-Fort Worth catastrophic hail storms. If you live in Dallas, Mesquite, Garland, Rowlett, Rockwall, Wylie, Sachse, Murphy, Plano, Allen, McKinney, Frisco, Addison, Irving, Arlington or Richardson, choose us as your Auto Hail Repair facility. We offer our customers Free Vehicle Pick Up & Delivery, Free Onsite Consultations and Waive Insurance Deductibles for most repairs. If you have one or more vehicles that received damage from one of the recent hail storms, do yourself a favor and choose us for all your Auto Hail Repair needs. 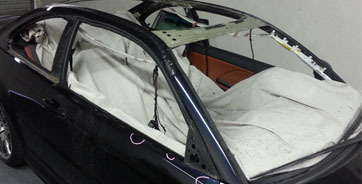 Our hail damage repair process is hassle-free. We work directly with your insurance company to get the proper repair value and return your vehicle back to you in pre-storm condition with no money out of pocket in most cases. Contact us today to start your Hassle-Free Auto Hail Repair! We offer our industry leading Auto Hail Repair and Paintless Dent Repair services to all impacted vehicles in Rockwall and Rowlett. If your vehicle is dented and dinged all over from the Rockwall/Rowlett 4/6/18 hail storm, give us a call to experience Hassle-Free Auto Hail Repair. All we do is hail and we do it well! We can handle all items damaged in the hail storm, no matter how minor or severe the damage. We are a true specialty body shop that is focused 100% on hail damaged vehicles. Avoid extreme repairs and tons of body filler and give us a call to experience what a true hail damage repair company is! We are conveniently located in Rowlett near Highway 66 & President George Bush Turnpike. 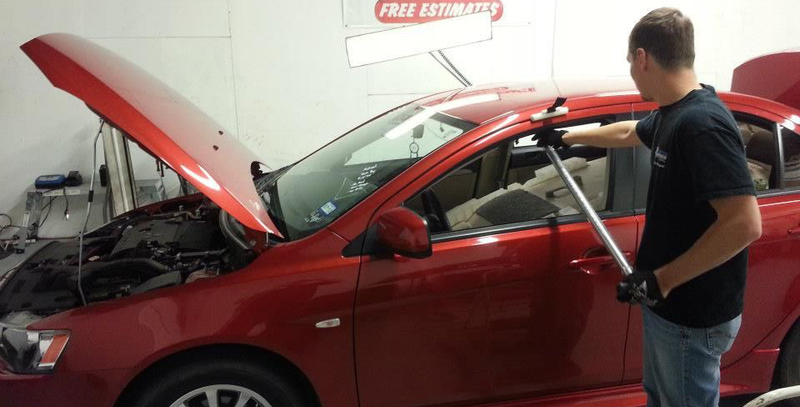 We proudly serve all Rockwall and Rowlett residents needing Auto Hail Damage Repair. When catastrophic hail storms hit the Dallas-Fort Worth Metroplex, the big decision vehicle owners have to make is who to use for their repair. Most people immediately think of taking their vehicle to a local body shop or dealership. Although this is an option for your Auto Hail Repair needs, it is not the best choice. Local dealerships and body shops do not have Paintless Dent Repair technicians and have to subcontract out any Paintless Dent Repair items on your vehicle to an external dent repair company. Do you really want to deal with the middle man when it comes to your hail damage repair? Since local dealerships and body shops do not have PDR technicians, they choose extreme repair methods to help control cost. 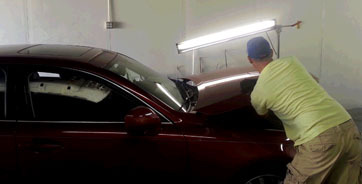 We constantly see panels being replaced, filled with body filler and painted that our Paintless Dent Repair technicians could of repaired beautifully in a matter of hours. We have PDR technicians and choose PDR 1st and replace/paint 2nd. If you want to keep your vehicle as original as possible, do not choose traditional body shops or dealerships for your hail repair needs. If you do you will have extended repair times and receive extreme repair methods on panels that a specialty Auto Hail Repair shop like us could of repaired in a matter of hours. We treat every vehicle at our shop like it is our personal vehicle, and make repair decisions based on that. Our shop is small but our results are industry leading. Before you take your hail damaged vehicle to a generalist, give us a call to get your vehicle in the hands of an expert Auto Hail Repair shop. Paintless Dent Repair aka “PDR” has continually improved over the years since being introduced to the United States in the late 1980’s. The tools used are no longer bent screwdrivers and homemade tools but are high quality precision cut tools offered for sale from major PDR tool manufacturers. A complete set a tools for one PDR Technician can easily cost upwards of $6,000. The quality and efficiency of Paintless Dent Repair has changed the mindset of insurance companies. The days of insurance companies writing up hail damaged vehicles as Conventional Paint & Body is gone. Insurance companies choose Paintless Dent Repair as the preferred method of repair for hail damaged vehicles for many reasons. Paintless Dent Repair is environmentally friendly, requires no body fillers, no paint and the repair time is drastically reduced when compared to Conventional Paint & Body techniques. When given the choice, customers also prefer Paintless Dent Repair because there is no risk of paint overspray, improper color matching and the integrity of the OEM paint is not effected. If you find your vehicle damaged from a hail storm do not hesitate to give us a call. We specialize in hail damaged vehicles and are experts in Paintless Dent Repair. Why would you want to take your vehicle to a generalist when we are specialist in hail damaged vehicles?